If you have not experienced Zeega, an online tool for creating digital media, it might be worth a gander. In a general explanation, Zeega allows you to construct a media project by borrowing images, sound, gifs and words from other sources, and then pulling it into one share-able project. What’s interesting about Zeega is that the user determines the pace of the story. It’s a shared agency between creator and reader. NOTE: The original Zeega has gone kaput. Plug pulled on new accounts and new Zeegas (but old ones can still be viewed). HOWEVER, Terry has done some resurrecting. So, you can make an account with this new version of Zeega, hosted by Terry. We don’t know if the system will stay stitched together, but we’ve never been afraid of breaking the Internet. For today’s Daily Connect, find someone in your network and honor them with a Zeega that features their words. Build media around someone else’s ideas. Honor thy neighbor. Terry has graciously shared out some of his Zeega projects in which he has done just this. (And earned the nickname, Captain Zeega). 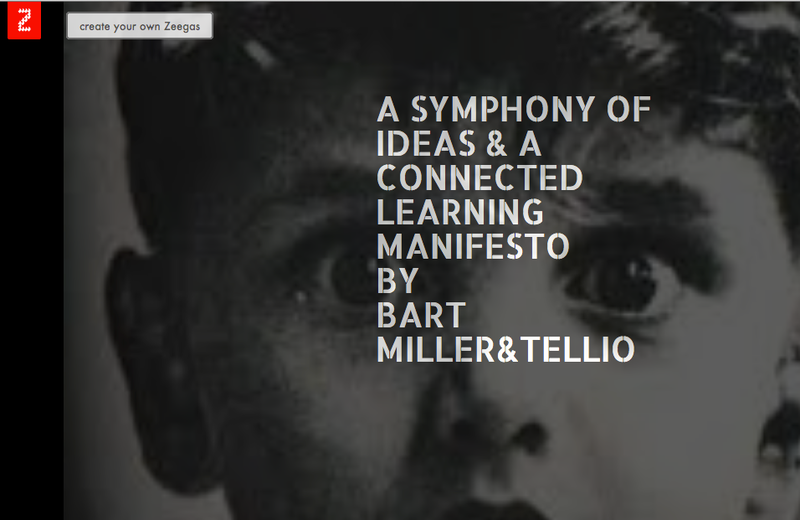 For example, Terry took a post by Bart Miller and made this Zeega project. Also, be sure to experience Terry’s Zeega thoughful ode to a late National Writing Project friend, Jenn Cook, whose presence is missed dearly in online endeavors (she would have jumped full-barrel into any Connected Learning venture, we suspect); and a poem by Mindy; and Michelle’s thoughts on coping with pain and confusion around an ailment, as transformed into a media project by Terry.